The harmonic treatment to re-temper the steel. Polish the surface of the shear. Rework the set and balance of the shear. Sharpen and hone to a razor sharp edge. For more information about the DK shear renewal offer, please contact me by calling 800-972-9223 or by emailing dkind93@gmail.com. 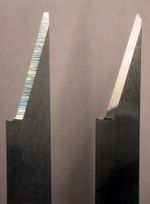 Here is the unsharpened (on the left) next to the sharpened edge (on the right). 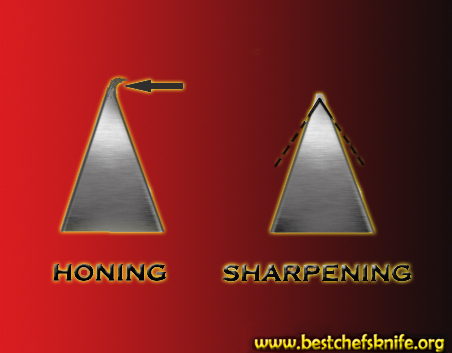 The honing process not only removes micro burrs that is left behind after sharpening an edge, but moves the molecular of the steel closer to gather, leaving not only a sharper edge but a stronger edge. The result is a stronger and sharper edge that will last longer. When we use this honing process on your precision cutting scissors edge, outside and inside edge, your scissors cutting action will be smoother and silky feel while cutting effortless through the hair, longer. 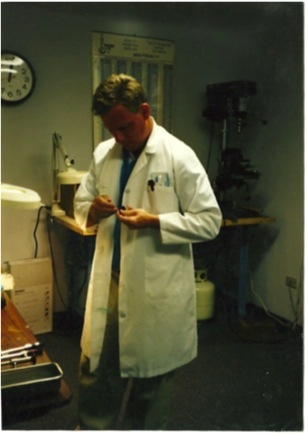 DK industries is the only company that uses the same equipment that the inventors used, the Japanese. We use both the honing wheel and compound. No one else has this equipment.